As we edge closer to the 2018 NFL Draft, Travis May offers an updated Top 100 Rookie Rankings. Welcome back all of you Dynasty Lifers! I greet you that way for two reasons. One, that’s my opening line on every episode of the Dynasty Life podcast (that I probably should have retired by now). And two, if you’re reading up on 100 incoming NFL offensive playmakers in January or February then dynasty is likely (a huge part of) your life. If you missed the November edition of this series there’s a blue hyperlink to click on, aptly placed on the word “November” because I like keeping things easy for my readers. If you checked that out, then welcome back again! Ha! I’m not that funny, but at least I make sad attempts in that direction. Anyway, I’m done with that. I promise (*crosses fingers*). Seriously though, we are less than a month away from NFL Combine week! It is (well past) time to dive head first into rookie draft planning and take the necessary steps to crush our league mates in the off-season. That’s why I put these lists together a few times every year. 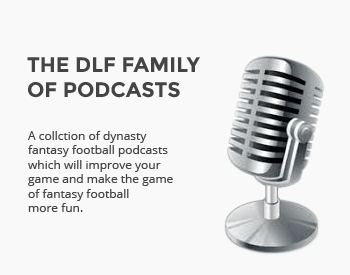 They’re just one step in the big picture process that is building your fantasy football dynasty (or maybe just building a knowledge base to impress your friends at the bar next week). Regardless of your reason for binging on rookies in January or February, I’m glad you’re here. Keep in mind, as I say every time, I’m not saying that this list is your magical ticket to dynasty championship land. You are most definitely going to disagree with (at least) one or two of these player rankings. And that’s great! You should. The whole point of this exercise is to share my knowledge, and give you another set of data to analyze and test against your own current understanding of the incoming draft class. So yes, Kalen Ballage truthers, I promise things will be okay even if I have him lower than you. And yes, I am probably insane for ranking DJ Moore that high. It’s fine. Let’s just tackle this class together and hopefully, we’ll teach each other something along the way. Please do make sure and leave a comment. I want to learn something from you all. And of course, feel free to reach out to me on the Twitter (@FF_TravisM). That’s the best way to antagonize me concerning your favorite players or perhaps become my best friend. And yes, I know this piece is incredibly long (Sorry James, the GOAT editor). There are 100 players to talk through. That takes a sec. Surprise! Everyone’s number one player is still sitting on his throne (of Bud Light probably spouting off “Dilly Dilly!”). Saquon Barkley has been unanimously perched atop the majority of dynasty rookie ranking lists ever since he dropped 358 total yards (305 from scrimmage) on Iowa in a nationally televised prime-time game last fall. Barkley did everything in that game. He carried the rock 28 times for 211 yards. He doubled his career record (at the time) for receptions in a game by grabbing 12 passes for 94 yards. The young stud king even showed some burst in the return game. From that point on the great BAEquon could do no wrong. It almost didn’t seem to matter that the very next game Saquon averaged 2.8 yards per carry against a less-than-stellar Indiana team. Yes, some people wanted to make a big deal out of his putrid performance against Ohio State in which he put up some of his worst tape of the year. But even then, most people chalked that up Ohio State’s dominant defensive line just eating Saquon up in the backfield before even Superman could evade a tackle. At the very least, Saquon showed he was indeed human this past season when it came to decision-making in hitting the hole. The majority of us dynasty fanatics want to view Saquon a la “vie en rose” (all googly-eyed no matter what) but the truth is this king has a few chinks in his armor. I’m not saying he isn’t the best player in this draft class. He most definitely is. However, the last time the dynasty community was this sure on a consensus number one player this early (in the fall of his final collegiate season) it was Trent Richardson. Let that sink in. Then select Saquon first overall and move on anyway. I can’t remember any time in dynasty that the number one and two picks seemed so clear this early. Obviously landing spot could change things, but Derrius Guice seems like the pick here in his own tier. Guice runs like a madman when he’s healthy. It’s truly comical watching just one defender trying to tackle Guice with a full head of steam. He invites contact. He seeks it out and then mutilates his opponents in the second level of defenses. Derrius exhibits all of the physical traits you want to see in a feature back. Plus he’s shown decisiveness, balance, vision, and extreme perseverance through some tough nagging injuries. The only real concerns with Guice may be health (given his playing style) and perhaps his receiving chops (given the small sample size), but most dynasty owners will look past that. Guice has RB1 potential. Treat him that way. Liked most…although I am hoping for more from Ballage…he is looking really good at Senior Bowl practices. I noticed you did not provide any comments on Freeman or Walton. Hi James. I too am hoping for more from Ballage, but he would have to defy everything that he’s put on tape thus far to succeed in a significant way at the next level. I’m hoping his faults were mostly linked to Arizona State’s putrid scheme and offensive line. And yes, I didn’t provide comments for all 100 players. Freeman has been a staple of Devy ranks for some time, but will likely be a mid-late round pick. Mark Walton is coming off an injury, but could still sneak into Day 2 from what I gather. I like both of them a lot. Wow. As always there is a ton of great stuff here…thanks, Travis! I’m really curious to see how teams value the twin Georgia backs. If someone spends a high pick on one, it could vault them up higher. The WRs all scare me. There’s going to be a few solid ones, but there are questions with all of them. I feel like most are landing spot dependent. Thank again for the hard work. I can imagine the time and effort that went into this. Hey Ryan, I think both Sony and Chubb should find success. I prefer Chubb as a runner inside. Sony probably has the edge outside and in the passing game. Sony has already vaulted up the consensus rankings ahead of Chubb among most in dynasty, which is why I think his value is already sapped. People want to make it an either/or thing with them. Both should be day two picks. The WRs all scare me too. James Washington simply presented the lowest chance of failure to me among other top options. Also, yes, Sony and Nick will both likely find pro success. I think many have already assumed Sony is superior, but I think they’re both fantastic. Both should perform well at the Combine. Loving all the analysis on the players. Been reading up a lot lately (mostly to get a read on players to be looking at with the 3rd pick in my league’s rookie draft) and seems a lot of people disagree on the order of that 3-8 range. So many intriguing guys but none really stand above the rest yet. I also think Michel is a guy we’re going to see climbing up the rankings as the draft nears. I think an NFL team is going to take him hoping he can handle the workload and be the next David Johnson. He has the mold and appears to have the receiving ability to be a PPR stud as a RB from what I’ve watched. I also so far have agreed that Washington is the best WR in the class. Sutton makes it a close call though. Love his effort in the blocking game and obviously his size. Hey Korey. You’re not alone in loving Sony. Most (if not all) of my DLF colleagues value Sony as a top five rookie pick already. What’s funny is that before the college playoff he was nowhere near that discussion. I think he will do well at the Combine and settle in the 3-5 range of most rookie drafts unless his landing spot looks particularly gross. I may find myself taking a running back at three as well unless a WR hits the jack pot with a solid young QB throwing his way.